Krista Lynne Jensen: We Hate Long Goodbyes... Don't We? I don't know who Blaise is, but I understand completely. Carla brought over three books and a file of articles before I started the revision. This book (pictured) was the most helpful by far. Never use two words, when one will do (ie. horrible, slithering vs. writhing). NO: There was a pathway lined with petunias. Don't over-explain. Readers are smart. This alone made it so much easier to chop 30 pages off the ending. Avoid word repetition. Stood up, turned around, shouted out, nodded his head... stood, turned, shouted, nodded. Start mid-scene. Just get right in there. List all characters and subplots. Those that are not a vital link to the main plot get cut. Bye-bye. Endings: Know when to shut up. Be bold, be brief, be gone. This is taking practice. I like the characters. I didn't want to leave them just yet! But I must. Maybe that is the real reason I wrote sequels. And, after all these rules and guidelines, it was so great to also learn that none of this should sacrifice the voice of the storyteller, the emotion, or imagery. We want to love what we read, as well as write. I am learning so much and it's all good. The second book, The Inn, should be a much cleaner manuscript when I submit it. 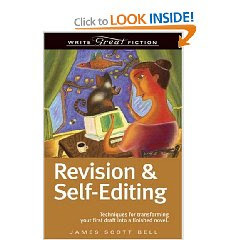 Thank you James Scott Bell and the other authors who share their wisdom. I have said what I have to say. Shutting up. Funny ending Kris. Those are all very good tips for writing. I will use them for my next novel. Oh wait...maybe for my blog.